Most natives will jump at the chance to tell you the vast differences in style. In fact, most Cajun’s get offended when you don’t know the difference. Both styles tend to be heavy in flavor, and rich at soul. Which goes along with the city’s motto, “Laissez les bon temps rouler” or “Let the good times roll”. But getting technical, what is the difference? When the Spaniards governed New Orleans they became known to Europe as Creoles. Today Creole style cooking has the influence of French, Spanish, and African cuisine. Cajuns are descendants of the French Acadians as they learned to live in the south Louisiana swamps. It is said the Creoles tend to use more tomatoes, butter and cream. Cajuns tend to use more spices and animal (pork) fat. After flipping thru a few recipes, I decided to make a Cajun influenced meal….. Minus the pork fat of course! 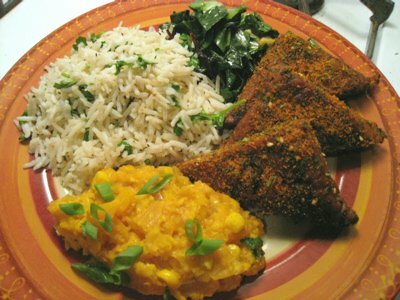 For the protein of the meal, I used tempeh, marinaded and baked it, then patted it in Cajun spices and lightly grilled the triangles. Garlicky greens are an essential for me with any southern style food. For the rice, I used white basmati, seasoned with Lemon zest, black pepper, and fresh parsley. As a bonus, and to help with the spice factor of the Cajun tempeh, I made a naturally sweetened corn relish. Here’s the corn relish recipe. Had I have used red bell peppers, instead of gold, the color would have been a bit more vibrant. I jut can’t help but love the taste of sweet golden peppers! Combine 2 cups of the corn, with the tomato juice in food processor. You may want to add a tiny bit of water to help smooth it out. in a medium sauce pan, heat the olive oil, and add the onion and bell pepper. When tender turn flame down to medium heat. Stir in the pureed corn mixture. Allow to simmer for a minute, then add the whole corn kernals, along with spices. 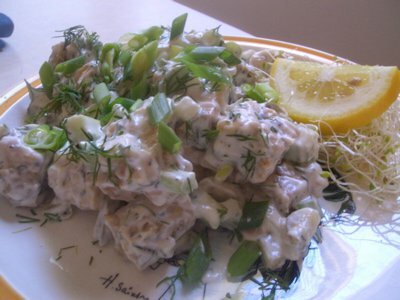 Garnish with some sliced green onion. 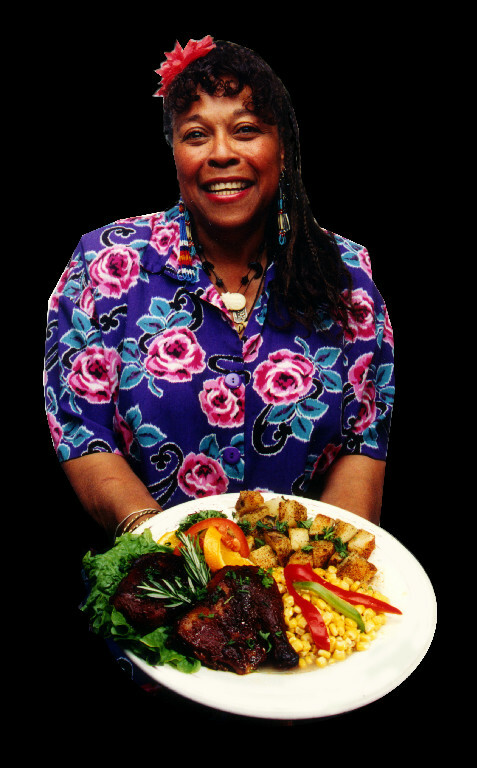 And below is a picture of Sweet Mama Janisse, owner and chef at Bless My Soul, a veggie-friendly creole style restaurant in Eureka, Ca. She specializes in delicious sauces, all mostly vegan friendly. And her vegan hush puppies are delectable. This entry was posted in Entrees, Gluten Free and tagged bless thy soul, cajun, corn relish, CReole, tempeh, vegan. No unfortunately I didn’t get to go. 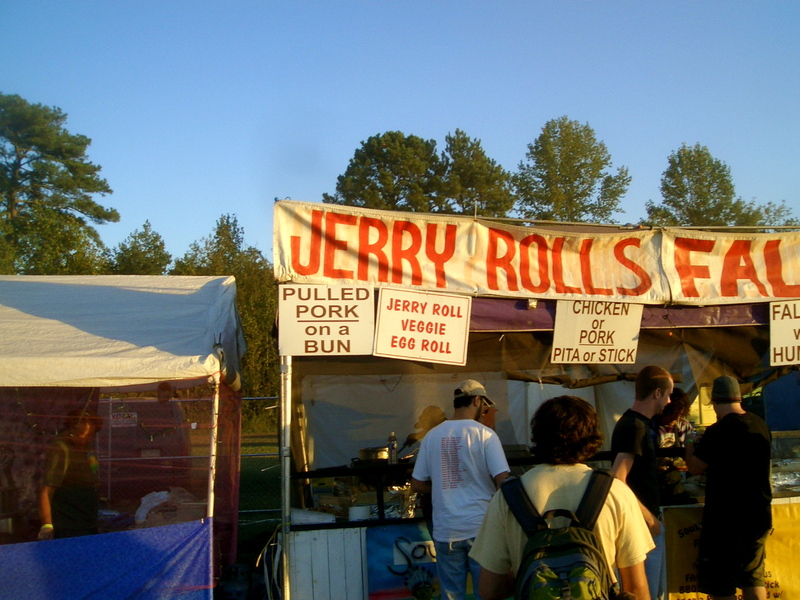 But yes, deep down, the dead head inside me would have liked to see Phil and Friends, and grubbed on some southern style vegan food all weekend long! The Echo-Project Festival primarily concentrates on waste management, energy resources, and habitat restoration. 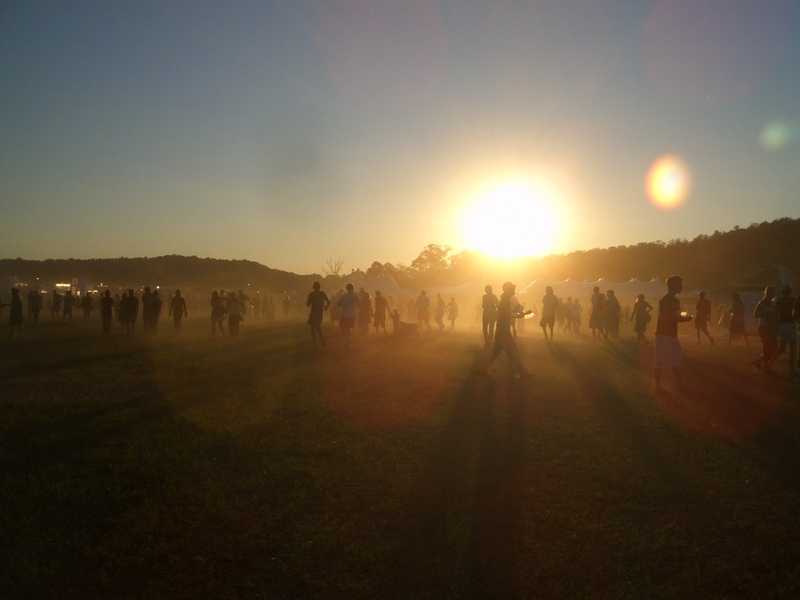 Spreading environmental awareness, all of the campgrounds and stages are powered by alternative energy sources! And with acts like The Flaming Lips, The Killers, The Roots, Thievery Corporation, Spoon, Cypress Hill, Moe, MMW, and of course The Album Leaf, whats to stop us echo-heads from going? Drew came back with some great pics. No credit to me! Father of the Electronic Synthesizer…. 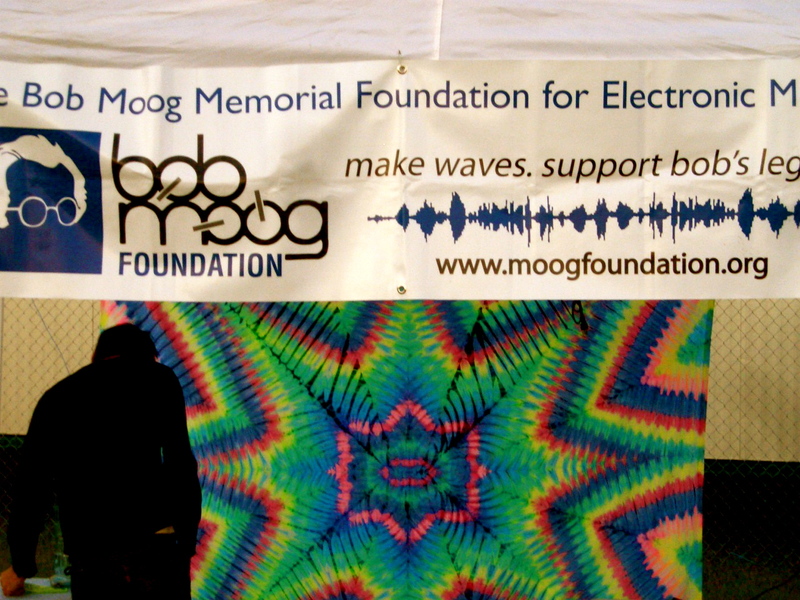 I was reminded of years back, of the Gathering of the Vibes Festival, held once again in Bridgeport Ct. This amazing Solar Smoothie guy, blended your smoothies with his stationary bicycle. So cool. I wonder if I could build one in my backyard…. If not in mine, I’m sure Vieve would appreciate it! 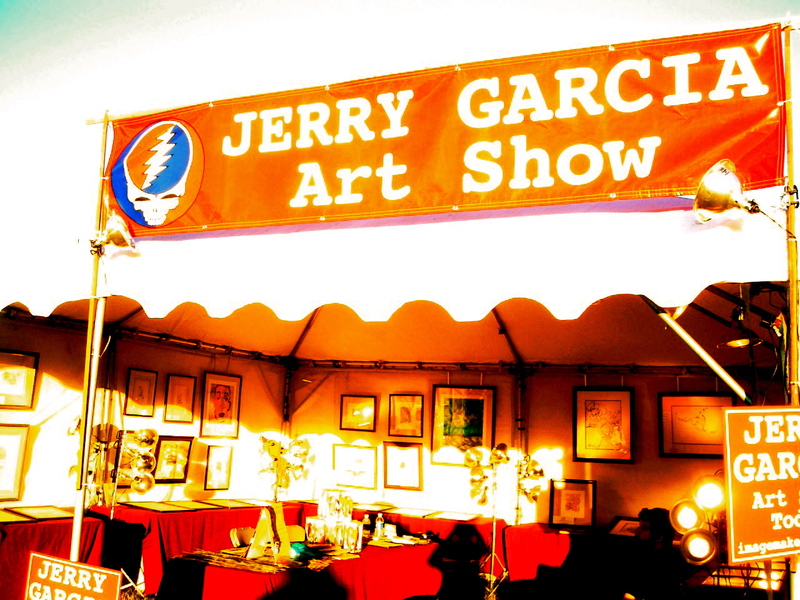 This entry was posted in Events, Places and tagged Echo project festival, GA, grateful dead, jerry garcia, tempeh. Tempeh is made by fermenting soybeans, binded together by a mold called rhizopus. I know what your thinking….a mold?!?!? Yes a mold! This mold produces a medicinal antibiotic to increase our bodies resistance to infections, and helps to eliminate toxins. 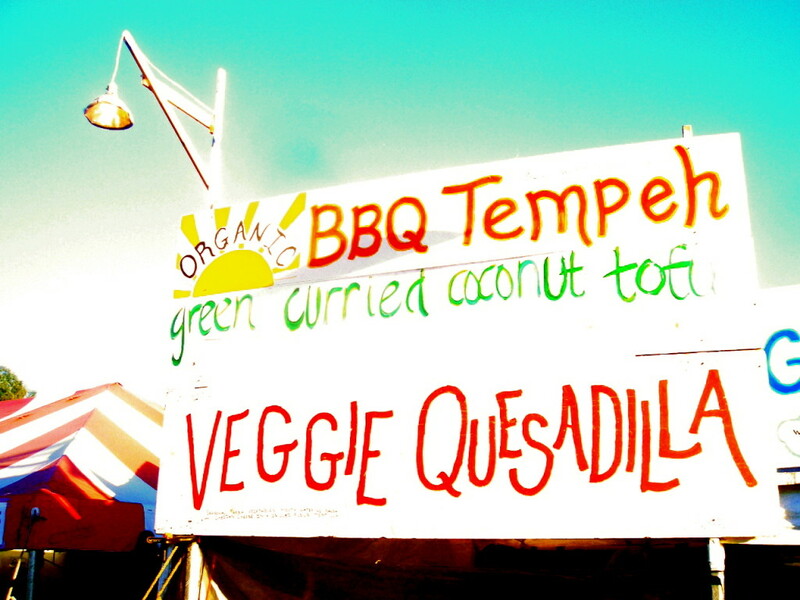 The most widely used tempeh, come in flavors such as flax or grain. This recipe was a KF favorite, now yours to share! Tempeh is best marinaded overnight. So its worth it to give your self some extra prep time. If your feeling frisky, mix in some sunflower seeds for an extra crunch! After marinaded, lightly sautee the tempeh, and all those yummy juices, till lightly browned. Allow to cool. ***When tempeh has cooled, mix into the large bowl. Test the flavor, you may want to add some sea salt & fresh ground pepper. This entry was posted in Entrees, Gluten Free and tagged lunch, salad, tempeh, vegan, vegpod.